On offer from us is a gamut of Ophthalmic Micro Surgical (Thin) Knives. All our products are developed employing latest technology and machines in sync with the norms laid down by the industry. The products offered by us are extensively used as important tool in ophthalmic surgical activities. Due to having attributes like lightweight, sharpness and durability, our offered knives are widely demanded by the patrons. Available with us is a wide and commendable range of Stab Knives (Extra Thin). All our products are developed employing latest machines and tools in sync with the norms laid down by the industry. Available in different sizes and specifications, our offered knives provide precise cuts with minimal cotton drag. The plastic handle of these products make offered knives easy to grip. Moreover, patrons can buy these knives from us by paying via varied simple modes, as per their ease. With the aid of our proficient professionals, we have been able to come up with a gamut of Slit Knives (Keratome) Extra Thin. 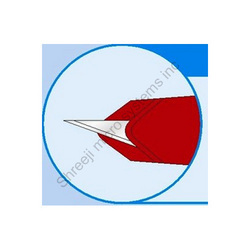 Developed in sync with the norms laid down by the industry, these are provided by us to the patrons with extra thin blades (For Entry in to Anterior Chamber or Phaco Stab Incision). Clients can avail these knives from us in different sizes and specifications in accordance with their needs. 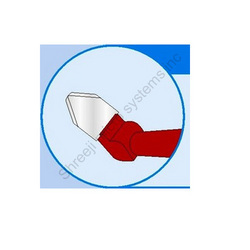 Due to lightweight and sharpness, our knives are widely demanded by the clients. Specifications: • 1.2 MM Full Handled Knives ST/Angled • 1.5 MM Full Handled Knives ST/Angled • 1.8 MM Full Handled Knives ST/Angled • 2.0 MM Full Handled Knives ST/Angled • 2.2 MM Full Handled Knives ST/Angled • 2.5 MM Full Handled Knives ST/Angled • 2.8 MM Full Handled Knives ST/Angled • 3.0 MM Full Handled Knives ST/Angled • 3.5 MM Full Handled Knives ST/Angled • 4.0 MM Full Handled Knives ST/Angled Specification : • 1.2 mm, 1.5 mm, 1.8 mm, 2.0mm, 2.2 mm, 2.5 mm, 2.75 mm, 2.85 mm, 3.0 mm, 3.2 mm, 3.5 mm 45oangled, full handled high sharp cutting edge. Made available by us is a wide and commendable gamut of Slit Knives (Enlarger) Extra Thin. All our products are developed employing latest machines and tools to enable sharp and precise cuts. 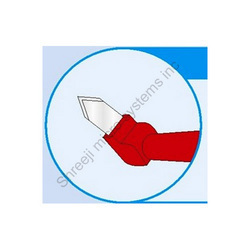 Available in various sizes and specifications, our offered knives are widely appreciated by the patrons for their seamless finishing, resistance against corrosion, durability and sharpness. The ophthalmic knives from the house of Shreeji Micro systems Inc are a product of export Quality and reasonable pricing. Composed using the latest state of the art systems, our knives come popular for their handiness and accuracy. SMS has been at the forefront of precision inclusion in Ophthalmic Knives very com-pack & Thinest Knives Success full in world wide Export. Backed by the sound experience of variegated pros and cons of the market, we have been able to offer a range of Enlarge Knives Blunt Extra Thin & Implant Knives. The products we offer are developed under the supervision of experienced quality inspectors in sync with the norms laid down by the industry. Due to fine finishing, sharpness and lightweight, our offered knives are widely utilized by the doctors in various surgeries. 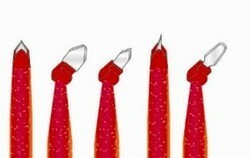 For implant knives : 5.0 mm, 5.2mm, 5.5 mm, full handled, 45oangled, both side cutting hi sharp cutting edge.